After 30 years of Discovery Channel’s Shark Week, it seems that everyone from the Food Network to NPR is taking part in some sort of shark content. However, our editor’s have gotten together and we are happy to be the only ones addressing the important question of where to stay for your shark encounter. While making a study here in 1987, Jacques Cousteau stated that this island has the greatest variety of fish in French Polynesia including sharks, especially at Shark’s Hole, a vertical wall dive spot. For those of us who aren’t certified divers, you can also snorkel the surface of the lagoon to catch glimpses of lionfish, barracuda, and yes – even sharks. As a guest of the Tikehau Pearl Beach Resort you receive complimentary snorkel equipment, or the staff can assist in arranging a dive excursion in the lagoon. Located at the Mayan Temple Slides, the Walking with the Sharks experience is easy and fun. Using state-of-the-art clear-glass helmets, guests can walk on the bottom of the aquarium and find themselves nose-to-nose with the “guardians of the lost world of Atlantis”. If you prefer a less hands-on approach to Shark Week, you can also take the “Leap of Faith” slide instead – an almost vertical 60 foot drop that plunges you directly through the shark lagoon via a tunnel. Intrepid travelers can partake in a cage dive or snorkel in the Pacific Ocean with North Shore Shark Adventures. Available to children as young as three as years old, it’s a heart-racing outing the entire family can enjoy. While shark sightings are 100% guaranteed, other marine life, such as dolphins, sea turtles, and humpback whales may also make an appearance. As an added bonus, if you are staying at the Prince Waikiki, North Shore Shark Adventures will gladly assist in arranging round trip transportation to and from the boat. All you’ll need to do is pack a bag and your sense of adventure. According to surf instructor Ant Scholte: “All the recent media attention around shark research, cage diving, and chumming in False Bay has definitely put the fear of sharks in the forefront of most surfers’ minds. I don’t believe that the ocean is any more ‘dangerous’ than in the past years, just that the subject of sharks in False Bay is being discussed more than usual at the moment.”. If getting right into the water sounds a little too intimidating, there are countless cage diving companies as well as breach tours that allow you to see the famous “Air Jaws” in South Africa from the deck of a boat. One of the most popular activities on Bora Bora is a Lagoon Safari Snorkeling Experience, where courageous visitors can swim alongside a variety of sharks, stingrays, turtles, and tropical fish. If you are staying at the St. Regis, they have their own private Lagoonarium for guests available to explore, or they can help you arrange a tour of Bora Bora’s lagoon on an authentic Polynesian outrigger canoe. From October to March, tourists can book an eight-hour whale shark tour in La Paz, just an hour and a half’s drive from the resorts in Cabo San Lucas. Venturing to the region’s popular feeding grounds in La Paz Bay, visitors can watch whale sharks measuring up to 40 feet in their natural habitat, and even rent a wetsuit and snorkel equipment to swim in the crystal clear waters for a better look. Truly the gentle giants of the shark family, these massive creatures eat only plankton and pose no risk to humans. 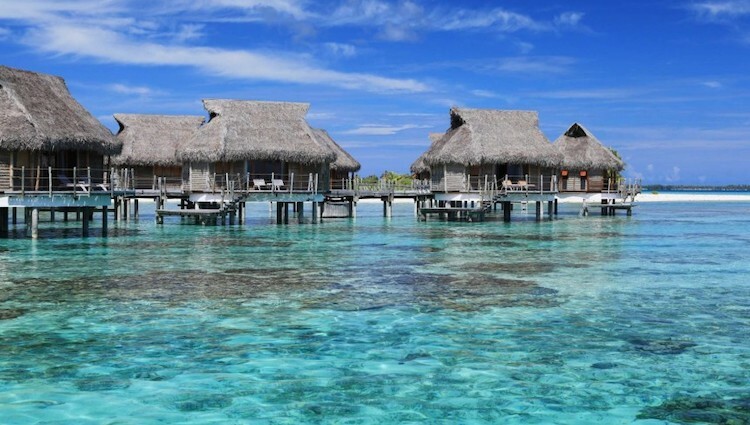 Maldives is revered worldwide for its unparalleled luxury and crystal clear waters. Located on the Arabian Sea in the Indian Ocean, the South Asian country consists of nearly 1,200 coral islands grouped into 26 atolls. Visitors who want to add an extra element of danger to their shark adventure should look into the Whale Shark Night Snorkel, or play it safe by watching from the boat’s observation deck. If you are feeling more adventurous, the Coco Bodu can also arrange a dive for you where you can see white tip and grey reef sharks. Nothing beats a night shark dive from Cairns to the outer Great Barrier Reef. You can spend one to seven nights aboard a reef tour boat with nightly underwater shark scuba diving adventures. The Hilton Cairns is only a 5 minutes’ walk from the Reef Fleet Terminal, Cairns’ “Gateway to the Great Barrier Reef”, from which point you have multiple options for sight-seeing tours, snorkel, and dive excursions. The Pacific currents in this area of Mexico are usually minimal which makes it an excellent dive spot for all leverls of diver. Solitary Rock is home to white-tip reef sharks, eagle rays, turtles, schools of tuna, and more. The circular path around this outlying rock is a great advanced, deep dive. November through May is considered to be the best time to dive off the coast of Ixtapa, and if you dive during the peak season there is a very good chance of seeing whale sharks in addition to the elusive and beautiful manta rays. Near Saint Lucia, you should expect to find Caribbean reef sharks, blacktip reef sharks, tiger sharks, nurse sharks and bull sharks. There are plenty of recommended dive shops on the island that offer night dives, drift dives, and everything in between. Anse Cochon beach in particular offers dive sites for every skill level, ranging from 10 foot beginner’s dives to wreck dives requiring enriched air tanks.